Every two years, the world embraces Olympic-mania, and the fashion scene is no exception - just look at the cover of Vogue's August issue! Athletes are used as models in magazine editorials, and high fashion brands frequently step in to design the opening and closing ceremony looks for their respective countries: Lacoste for France, Stella McCartney for the United Kingdom, Giorgio Armani for Italy, and Ralph Lauren for the United States, among others. The athleisure trend shows no signs of slowing down on the runway and in stores, in part encouraged by the Games in Rio. 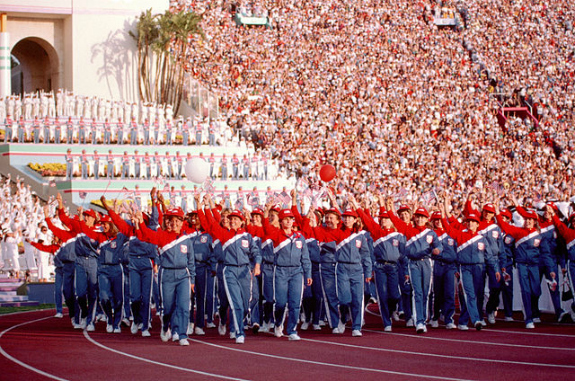 In 1984, the Olympics were hosted in the FIDM Museum's own Los Angeles; coincidentally, it was the same year the Games opened to corporate sponsorship, meaning athletes competed in uniforms with official sportswear logos, such as Nike, Adidas, and Reebok. The integration of sports and fashion continued at the couture level when French designer Thierry Mugler dedicated his Printemps/Été 1984 collection to the Olympics, complete with an Opening Ceremony themed runway. Mugler began his career as a dancer, giving him an understanding and appreciation for athleticism that is clear in his striking sketches, such as the "Natique Epique" swimmers from his Olympics collection shown above. His runway shows were always spectacular and theatrical, and his Olympics-inspired production was no exception. Model Iman wearing white sportswear and carrying a javelin perfectly showcases the exercise trend that emphasized toned and tanned bodies in the 1980s; for example, Team USA entered the stadium for the 1984 Opening Ceremonies wearing two-piece casual tracksuits, unlike the more formal ensembles of past Olympics. Screenshot of Spring/Summer 1984 Runway; full video on YouTube. We hope you’ve enjoyed the FIDM Museum’s look at sports and fashion throughout the Olympic Games. Don’t forget, there will be more to come as we share details of our upcoming 2019 sportswear exhibition Outdoor Girls: Sporting Fashion, 1800 to 1950s…stay tuned! "Olympic Sportswear: A Complete History," V is for Vintage, August 3, 2012: http://visforvintage.net/2012/08/03/olympics-sportswear-a-complete-history/. Danièle Bott, Thierry Mugler: Galaxy Glamour (London: Thames & Hudson, 2010): 5. Though masculine in style, the hourglass shape of these dotted wool waistcoats could only have been achieved by a corset--probably a lightly-boned version designed for horseback riding. The Mayfair firm John Busvine & Co. advertised itself as "Tailors and Riding Habit Makers to the Royal Family and the Courts of Europe." It was not unusual for tailors to make women's riding clothes as well as men's suits; women typically wore sturdy, masculine-style clothing for the energetic sports of riding and hunting, though they always rode sidesaddle, in skirts. These waistcoats were tailored for Alexandra, Princess of Wales, daughter-in-law to Queen Victoria, whose beauty, active lifestyle, and taste for elegant adaptations of menswear made her a fashion icon. Busvine & Co. counted several of Queen Victoria's daughters among its clients, as well as the Empresses of Germany and Russia and the Infanta of Spain. Evidently, Alexandra continued to patronize the firm after her husband, Edward VII, inherited the throne in 1901; by 1903, their advertisements boasted "By Special Appointment to Her Majesty the Queen." These are just two of many important royal garments in the Helen Larson Historic Fashion Collection, which is now is in danger of being dispersed forever or absorbed into another private collection, inaccessible to students, researchers, and the general public. The FIDM Museum needs your help to save the Larson collection. You can make a contribution of any amount online or by mail. Donations are tax deductible; if your company has a matching gift program, your support will go even further. The FIDM Museum has until the end of 2015 to finish raising the necessary funds, so now is the time to join the campaign and help make fashion history. Marley Healy is a recent graduate of the MA program in Fashion Curation at the London College of Fashion. While in London, Marley worked on a variety of curatorial projects including exhibitions with the Rambert ballet company archive, the University of the Arts London, and Savage Beauty at the Victoria & Albert Museum. Originally from Southern California, Marley returned from London to finish her dissertation and spent the fall interning at the FIDM Museum. During the final months of my graduate program, as I engaged in the vicious cycle of writing, editing, and rewriting my dissertation, I was fortunate to have the best distraction possible. I had the pleasure of working with the brilliant staff of the FIDM Museum, assisting with various curatorial projects that often allowed me to intimately handle dress objects and practice good old-fashioned research methods. Serendipitously, my dissertation research on late nineteenth-century and early twentieth-century women’s sportswear followed a parallel research trajectory to that of a future exhibition being planned by FIDM Museum staff, affording me the unique opportunity of conducting mutually beneficial research. An important rung on the research ladder is the consultation of primary sources, and what better source for fashion and dress than a fashion magazine? Contemporary magazines illuminate a hodge-podge of era-specific preoccupations that give insight into the unique socio-cultural makeup of the people who read them. Having worked with magazine archives extensively (American Vogue is a favorite go-to) I was delighted to have the opportunity to utilize the FIDM Museum’s collection of La Mode Illustrée, a French fashion periodical that came into circulation during the mid-nineteenth century. As its title suggests, La Mode Illustrée was dedicated to the dissemination of fashionable garments and accessories, but its concept of “fashion” extended far beyond objects of personal adornment. Stipulated underneath the scrolling title were the words “Journal de la Famille,” a reminder that the magazine’s content reinforced suitable feminine ideals. Embroidery patterns, serialized short stories, and other miscellaneous, family-themed editorial content fleshed out the publication’s pages. The FIDM Museum’s collection spans 1869 through 1911, a time frame that was conveniently significant to my dissertation. I spent hours poring over the slightly foxed and occasionally torn pages. While most people might find carefully turning page by singular page a tedious affair, I relished the careful attention I was able to pay to each of them individually. My focus was directed towards locating fashion illustrations of “sportswear” in its most literal sense. Dozens of fashion plates showed ensembles for seemingly every possible activity in which one could engage. Wedding gowns, travelling outfits, and even fancy dress costumes broke up the monotony of typical day and evening garments that were necessary elements of the publication, but the illustrations of sportswear for outdoor activities were by far the most interesting. Season to season, La Mode Illustrée showed sportswear and activities that harmonized with the weather. For example, throughout the spring and summer, young ladies are depicted frolicking at the beach in bathing attire; in the fall, they promenade through tree-lined parks. Conversely, fur trims and heavy layers keep out the cold for ladies shown skating and sledding through the snowy months of winter. Ensembles for the more daring sportswomen who engaged in horseback riding and hunting are sprinkled through the various issues. These images offer a myriad of details regarding styling, fit, and even sport-specific accessories. These valuable points of reference will inspire the styling of the FIDM Museum’s planned sportswear exhibition. My time at the FIDM Museum reinforced my passion for the art of fashion curation and I appreciate the wonderful museum staffers who patiently answered my questions and encouraged me throughout the process of completing my dissertation. Overall, the internship experience was a joyful undertaking and I look forward to collaborating with the FIDM Museum in the future!